• Honour citation sheds light on security industry's role in 'War on Terror'. • G4S Gurkhas deployed against environmental protesters in the UK. Four former British Army Gurkhas employed by G4S have become the first private security operatives to receive the Queen’s Gallantry Medal (QGM) for exemplary acts of bravery. G4S soldiers-for-hire Deepak Kumar Thapa, Janga Bahadur Gurung, Jeetman Sharu Magar and Shayam Kumar Limbu received the honour for resisting an attack on the British Council compound in the Afghan capital, Kabul, in August 2011, according to the Civilian Gallantry List published yesterday. The citation describes a “complex attack” on the compound, involving two explosive-laden suicide vehicles and “an assault by four heavily armed insurgents”. On the night of 19 August 2011 the compound was guarded by eleven G4S operatives including four armed Gurkha guards, six unarmed Afghan National security staff and one British national security manager/bodyguard, according to the citation. Three of the Afghan security guards were killed by small arms fire, three others were wounded by blast and small arms fire but survived, and three of the four Gurkha guards were wounded. Despite receiving a gunshot wound to the head, Shayam Limbu “stayed in the guardhouse area and protected the wounded Afghan National staff until he was rescued”. Another G4S employee, Hameed Choudhry, was awarded a Queen’s Commendation for Bravery (QCB) for his actions during the attack. G4S said that the QCB “equates to a Mention in Dispatches”. G4S, the world's leading security company, and a major public services outsourcer in the UK, running children's homes, prisons and NHS services, says it has employed ex-Gurkhas within its Risk Services business for more than 20 years, “mainly working on British Government contracts overseas, in high threat environments”. The company’s private army of ex-Gurkhas is also deployed against civilians in the UK. 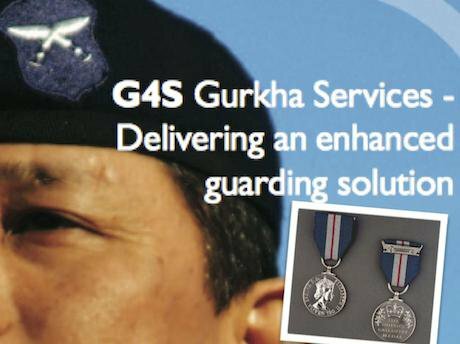 In the G4S sales brochure, former Gurkhas are marketed (under the slogan “Security with military precision”) to corporations seeking protection from metal thieves and from people protesting against fracking, nuclear power, and coal-fired power stations. The “enhanced security” on offer includes surveillance services. Barrie Millett, head of business resilience at E-ON, said that G4S Gurkhas were “responsive and pro-active and they act swiftly to manage and resolve issues with minimal impact”.